Whether you’re already employed as a mechanic and thinking about working for yourself, or getting ready to turn your passion for engines into your profession, the things you need to think about are essentially the same. This simple guide will take you through all those considerations in turn, so you can get a better idea of the path you need to take to turn your ambition into a reality. Why become a self-employed mechanic? There are lots of benefits to being a self-employed mechanic. The first is that you get to work with vehicles of all kinds, helping take care of all the essential maintenance that most people can’t or don’t want to do themselves. This could be anything from changing tyres and fixing faults to carrying out MOTs, changing brake pads and full servicing – not much fun for the average person, but if you love cars, vans and motorbikes then you’re doing your hobby and getting paid! Another big benefit to being a self-employed mechanic is that you have the opportunity to make more money than you would on a PAYE salary. For instance, you can claim back tax on tools and some clothing. Setting your own rates and applying intelligent tax planning should also ensure you earn more money each week than you would in a job. You can also choose your own hours, and decide where you want to work, so you can minimise – or maximise – the amount of work you do. 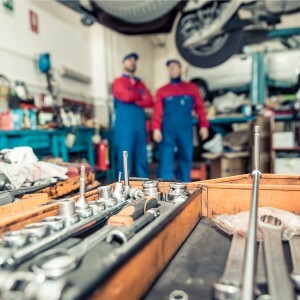 What do you need to become a self-employed mechanic? As well as a detailed working knowledge of different kinds of vehicles, all mechanics need a core selection of equipment and clothing, and either a dedicated garage space or a spacious vehicle that lets you take your tools with you to jobs. Beyond these essentials, you will probably want to invest in the basics that most small businesses or freelancers need to operate efficiently, namely a way of keeping your paperwork together, a computer and a mobile phone. You’ll also need to think about how you want to structure your business. Do you plan on doing contract work for others or do you want to work as a limited company director? Both ways have their benefits. If you choose to work as a limited company you may have to do a little extra paperwork but the rewards are much greater. Our sister company, ClearSky Contractor Accounting have a number of helpful guides for when it comes to contracting that will answer any questions you may have. What kind of qualifications do you need? To work as a self-employed mechanic there are some qualifications you will need, and others that will help. Lots of colleges offer courses for mechanics that will give you the core knowledge needed to begin to trade legally, often with flexible study options that fit round other commitments. A course that takes you from a basic interest and understanding of engines to a Level 1 Certificate/Diploma in Vehicle Maintenance is an excellent starting point. Another good way to gain the skills you need, if you don’t already have them, is through an apprenticeship. Most apprenticeships will require certain GCSEs – usually Science, English and Maths – but it’s worth looking at different college enrolment criteria as this can vary. Mechanics, especially freelance ones, don’t always work from a garage and if you’re start up funds are limited you may want to consider trading as a mobile business. By traveling to your clients, wherever they may be, you’ll add an additional level of convenience that other mechanics may not be able to provide, as well as saving you money on your monthly outgoings. Of course, bear in mind that working in this way will mean transporting your tools everywhere and being on the road a lot. A garage can also offer customers an added level of reassurance. There’s no right or wrong way, and there’s no reason why you couldn’t change your approach down the line, you just need to be determine which is right for you now. How will you find new business? What about doing the accounts? Accounting can be the final hurdle for anyone thinking of becoming self-employed, not just mechanics. But there are lots of accountancy services available who can help get you set up and registered with HMRC, then assist you with all your accounts throughout the year. Brian Alfred are specialists in providing accountancy and tax support to mechanics and builders, which means not only can we help you get the basics right, we know about all the different specific tax laws relating to these trades too. So we can help make sure you have as much money in your pocket as possible from your new venture, including getting you any tax rebate you’re entitled to within 24 hours of application.